Holiday traditions are odd things, aren’t they? Some are considered quite common. Others not so much. As a child, I thought everyone gathered around Aunt Margaret at the piano to sing Christmas carols. I figured most families dragged out their bell collection (some very liberty-like, others of the souvenir variety) every year for an ear-piercing version of Jingle Bells. Eek! I also assumed serving egg-nog (with far too much, bourbon, cheers to Aunt Alice) from a century-old punchbowl was, you know, normal. But we all create a baseline from the family we knew. And I’m here to tell you, traditions don’t have to be big. They don’t have to be hilarious. They don’t have to be epic. They just have to exist. They matter. Why? When the world feels unstable, when natural disasters seem too frequent and when tragedy is far too common, it’s nice to know some things never change. A little bit like the seasons, traditions provide predictability. Something you can count on in an impermanent world. So do me a favor. Resist the urge to “shake it up” this season. Keep your own sense of peace - your safety net space. Whether it’s gathering everyone for a photo in front of the fireplace, eating pickled beets out of jars or gingerbread frosting fights (sometimes not so friendly) in the kitchen, keep your traditions. Start new ones. Maintain old ones. Lead the charge - even against grumpy men and bratty toddlers. Make it happen. In lieu of a full blog post this week, please take note of my Member Spotlight hosted by Williamson Inc, aka the Williamson County Chamber of Commerce. Since joining in early 2017 I have served the organization on two committees, which also provided opportunities to volunteer in the community with organizations such as Gigi's Playhouse, Healing Housing, the LLS in 2019, etc. Joining Williamson Inc has introduced me to new development in the area and a variety of businesses and potential partners. Please read more about my journey as an artist & businesswoman by clicking here. It’s the end of autumn. The leaves are browning and crunching under kids’ feet. Instagram is chock full of new ways to craft and bake with pumpkins and apples. The scent of cinnamon is everywhere. Then you hear it, “So what are your plans for the holidays?”And the fall season literally falls away. You think about the parties. The concerts. The road trips, flights, dinners, decorations, traffic, and cookies . . . oh the cookies. And--the holiday card. What’s your plan? Here’s some advice for all those decisions. Don’t forget to breathe. 1. What’s the best backdrop? Choices are many and you can’t really go wrong. Want something seasonal, go with the fireplace stockings or snow. If neutral is better, white brick is fabulous for Instagram posts. More drama and elegance demands something darker and richer. Consider different theme options--have a holiday pajama party or go with a superhero thing. If you’re not into a theme, select a cohesive neutral palette. Pick a family: dark and dramatic? Black, navy and charcoal. Light and snowy? (white, light blue, blush). Hint: Let the kids weigh in. It will make them so much happier that day. With so many people opting to DIY their cards these days as a postcard, I enjoy receiving a folded greeting card. It’s a throwback. A classic. It has finesse. It’s unexpected. And less likely to get lost in the sea of holiday magazines and greetings. 4) Stylish paper or recycled? Online, glossy and matte are where the choices end. But a local stationery shop (Go local!) has a lot more to offer. As for the paper selection, you can’t lose. Stylish looks amazing. Recycled gives that crafty feel and gives you environmental points! My compromise is a green linen--environmentally healthy, but still bright and sassy. Enlist the kids to help you make a list. No need to go overboard. Facebook provides a lot of updates these days. When there’s less, they’re more precious. If you’re spreadsheet happy, great. But if you're tired, never mind the spreadsheet and just wing it. Thirty is a nice round number. 6) Any advice for the kids? Kids keep the fun going--and thank goodness for that. Why not channel their energy toward the joy of the photo? What to do? Once you’ve posed for the traditional family photo, take a few for fun: Make funny faces, jump up and down, have an impromptu dance party, play tag, sing songs or have a popcorn fight. Whatever suits your silly! If all of this sounds too complicated, never fear! You can always come to me and I’ll take care of walking you through all the details so you and your loved ones look like the masterpieces you know them to be. Hosting Thanksgiving tomorrow and you still want to get a family portrait from the big day? You stop and wonder how on earth you’ll get the meal out in a reasonable amount of time, much less get everyone together in a photograph. Pace everyone out: Incorporate the sofa - even the ends of the sofa - or some kitchen chairs to stagger everyone out in terms of height. Otherwise, everyone clusters in a big clump and they look uncomfortable (because they are uncomfortably crowded), OR everyone is in a long line and it resembles more of a line up than anything festive. For instance, got a loveseat? Great! Place a few of the younger kids on the floor in front of the loveseat - with a board book or a toy if that keeps them occupied, then seat 3 grown-ups on the loveseat itself, followed by adults on either end of the loveseat, and then fill in the remain adults around the edges. Voila! Does that change things? Lengthen Out: Whether standing or sitting, everyone should use good posture - aka no slouching. Got some taller folks throwing off your composition - i.e. out of frame? Have them take a seat or take a knee - even kneel on an ottoman that others are seated on, or take a wide stance so that they’re on a similar plane as everyone else. Level up: As in, take one of those boxes from Amazon thanks to early holiday specials or a step-stool and use it to add some height to your camera. Time it: Use a timer so you can be in it with everyone else. Leave a gap in the pose so you have a set spot just for you. Remember, someday the rest of the family might wonder where you were that year. Plus, fair is fair - if you want the photograph, you should be willing to be in it. BONUS: Be sneaky: Can you set the camera up to take 3 photos in a row? Do it! Then, tell everyone to smile for the first & make a goofy face for the second. By the third, everyone will be relaxed and laughing - an improv moment of fun in the family. Ghosts, Ghouls, and Goblins: How to Photograph Yours! The pumpkin lattes are pouring. Hayrides have begun. Pumpkin patch field trips are in full swing. The local farmers’ market has gourd and squash towers for toppling. How will you capture the costumes this Halloween? Simple and scary anyone attending the Monster Mash--and unafraid of ghosts. Adds typically unwanted shadows (ha!) but also accentuate cheekbones and noses for an eerie effect. Hand it over to the ghoul of choice. They hold it under their chin, but outside the camera frame, light facing up. Your favorite kiddo is a werewolf, but it’s only 5:00 and time to trick or treat. Here’s how to get moonglow before sundown. Find a flashlight (yellow) or some glowsticks (white-blue). A tablet also works. Head to the darkest room of your house. Have a helper beam your light tool downwards from above. Play around with angle and aim. Put your camera flash in “night” mode if you have it. No flash. The idea is to capture kids and costumes in motion--they’ll be moving faster than the camera so there’s a bit of a blur (aka ghost) in the frame. Try SCO or Camera+--both apps can adjust your shutter speed. People walk at a 1/30th second so try shutter at 1/50th. Aim the camera at another nearby object. Shimmery makeup typically doesn’t play well with flash and will create hotspots. Add twinkle lights (many come with a battery pack) to any costume for added dazzle and cool photography, just mind it doesn’t constrict movement (or even breathing). And yet. Reality rarely looks quite as good as you thought it would. Before you keep going, put your hammer down, play some music that will soothe you, take a deep breath, and consider the myths below. Now, in one sense, that’s true. I’m not necessarily advocating for expensive frames. I’m a Michael’s girl myself. However, coordinated a color palette is wise, especially one that goes with your decor. For a classic look, match. For more eclectic, choose a neutral or two (e.g. white & gold, silver & gold, black & charcoal) and then select a color pop for a standout piece. Perhaps a color that’s elsewhere in the room ( (ruby red, emerald green, and daisy yellow have been popular recently). And don’t forget the age of the photo. Anything over 50 years old could have a crumbling frame. Tap a local frame shop for something climate-appropriate ro research online for a supplier like American Frame, which offers acid-free mounting and UV-resistant acrylic. Myth 2: You don’t need a plan. Ahem, ok, are you putting up one piece or a few pieces together? Do you know where the center of the available space is? Trust me, a plan will save you time and spare you some frustration. Where to start? Measure the space available. Measure your framed pieces. Allow for spaces. Not great with math? No problem. Grab some bulletin board paper and trace the outlines of the frames. Now use some painters tape to place the items in the available space to do your planning. It’ll give you a sense of the scale, space and how your frames will look as a whole. PS If you make a note on the tracing paper where the hooks are, you’ll save yourself a lot of angst getting the correct placement for hanging hooks/nails/etc. Myth 3: You can do this with any old nail or wire--whatever’s at the bottom of the junk drawer. First off, consider your canvas. What are you hanging stuff on? Drywall? Lathe and plaster? Brick? Most walls require hardware wire--not just crafty, bouquet-wrapping wire. Choose new straight nails As for nails, ditch anything rusty that might have come with the frame and splurge (lol) on new straight nails or if you’re hanging on drywall, get some hanging hooks delivered to your door. Plaster and brick require something sturdier. Tap into YouTube for help. This Old House covers Hanging a Heavy Mirror on Plaster. Myth 4: You don’t need help. It’s okay if hanging art isn’t your superpower. I’m sure you’re good at lots of things! Find a local handyman on NextDoor or ask a relative or friend who’s more tool-inclined. Sometimes outsourcing just makes everything go smoother. Whew. Now that you know myth from truth, it just takes the courage to begin. Remember, when it comes to family photos, it’s all beautiful! *By the way, I don’t make any money providing links to products, but I’m also not responsible for the product or your use of them. With all this hurricane drama--Florence’s wrath has come and gone--I think it’s time to talk about backing up your family photographs. Natural disasters come when you least expect them. Earthquakes, mudslides, hurricanes, and tornadoes are all alive and well in our weather system-- it just depends on where you live! But I’m not talking about your digital cache. I mean the good old-fashioned stuff you hold in your hand. Maybe the ones that have been sitting in your spare bedroom for months now. Those filed away in your attic (hopefully not) or basement. But I’d argue that you don’t have time NOT to. That photo of your grandparents after the stop at the courthouse before he left for the war? Your favorite Great-Aunt Adelaide on her wedding day? Are you the only one in the family who has a copy? Trust me, it’s time. #1 Leverage those doubles from yesteryear! Find your stash of doubles from the pre-digital days--either in the basement or (I hope not) the attic. Find your favorite two dozen & place them in an acid-free envelope. Place the envelope in your evacuation go-bag. Now your favorite memories from the various field trips, vacations, and holidays can join you on the road trip ahead. Don’t forget the big photo envelopes. Moms are notorious for over-ordering and then never passing out the pics. Divvy those up and distribute between siblings so everyone has a few snapshots of you from 3rd grade! My brother has copies of my school photos and vice-versa. These spark terrific discussion when your niece sees your crimped-80s hair and bright fluorescent clothing choices. Bonus tip: Grab an acid-free pen and note the year of the image or the age of the kid in the image. #2 Scan the snapshots with your device. In addition to the paper copies, take a few minutes to scan the snapshot stack and any images you inherited (e.g those wedding & engagement portraits mentioned above or the one of cousin Ethel who did go uphill to school each day). And don’t forget a few school snapshots - you know, the ones from the Thanksgiving pageant and the Springtime sing-along. Phone cameras work, but GeniusScan (app) is even higher quality and can be saved directly to Google Drive for backup. A USB works well too--then it can go in your evacuation envelope you’ve got stashed by the bed! Having backups in both print & digital when you can is the best of both worlds because it provides you with more options and minimizing your chance of a loss. Happy storing! #3: Use a good old fashioned safety deposit box. Remember when you went with Mom and Dad to the bank to put something in the safety deposit box. It was a secret drawer and only you had the key. These may have fallen slightly out of fashion in the digital age, but I’d argue there are still some paper items worth protecting! Photos for one! Safety deposit boxes are still available at some banks and most are in a vault, which means it has additional security. This New York Times article* can tell you more. You can also ask your estate lawyer or insurance agent to keep an envelope in their office as a backup. Or, if you want to keep it in your own home, check out this fireproof document safe*. Whether you go digital or opt for the safety deposit box, why not save these pieces of your ancestry? Do it for you! Do it for your children. Do it for future generations! “I love wall art! So where do I put the photographs?” It’s a common question I hear when I’m out networking. In today’s homes, the two most popular family portraiture spots are in the main room (think above the couch or mantel) or the bedroom (particularly senior photos and newborns). When those areas fill up, my clients are hesitant to get creative with other spaces or they get stuck because they don’t think it’s possible to integrate the photos with their interior design. But I’m here to tell you there’s a way! Allow me to offer my top four fantastic suggestions on prime portraiture placement. The Kitchen. The kitchen is the heart of the home. No bones about it. It’s the place where parties gather--those you live with and those you don’t. It’s the location where teens stand and snack. The place where guests crowd the island. And as a family, it’s often where we cook, laugh, snack, argue and hug. Why not add the faces of your loved one here, where you’re really living? The Dining Room. The dining room portrait fell out of trend for a bit (okay, a few years), as society went rogue with camera phones and steered every so slightly away from tradition. But I’m telling you it’s back. Here is the place to coordinate, ever so simply, (frames, color, texture) with your decor. It’s a place to get formal, go grand, and create timeless heirlooms that will get passed down for years. The Main Hallway The main hallway is often what we call filler space, artistically speaking. If it’s fairly long, it can accommodate a gallery of portraits running the length of your house. If it’s shorter, think a small collection for each child. It’s a place guests are walking, often alone, on their way to the bathroom during a dinner party. And it will give them a chance to look closely at your beautiful family without the distraction of food or discussion. The Bathroom. Yes, you heard me right. Okay, so you’re not going to put a family photo in the bathroom. But that silhouette of your three children in the rose garden. Yup. Save your artsy, instagrammy photos for here and add an element of design to the typically drab and predictable bathroom decor. Walk In Closet: When they’re off to summer camp or college, why not sneak in a favorite snapshot or portrait here as a reminder--the first thing you see when you awake? Or maybe a selfie that tells you just how fabulous you are. It’s a terrific reminder as we choose our clothing and accessories for the day. Foyer. It’s a great feeling to walk into a home and be greeted by familiar faces and smiles and works particularly well if you have a larger entryway with multiple walls. What’s your favorite spot to hang a portrait? Reality: I know this won’t come as a shocker, but with photographs, less IS more. Books line the stores with ways to tidy up. Millennials are driving an experience-based economy. It’s all around and there’s no denying it. There’s simply no need to keep all 67 images from that trip to Gulf Shores in 1991. Wouldn’t it be better to have a few standout photographs in frames and on your walls. Maybe another handful in an album? Wouldn’t it be nice to know that shoebox is gone? Solution: Start clearing it out and organizing them now. It’s never too late to begin. Myth: You’ll eventually get to that stack of photo albums sitting in the guest bedroom. The same one that’s been there since 2016. How often am I in here? Does anyone else know about these boxes? Do I need to move before I’ll make this happen? Solution: One step at a time. First, do what I call the First Filter. Make two piles: Keep and Toss. (No “Maybe” pile allowed). Pass along other images or discard the rest. You can even send a stack away to photo scanning companies to get digital copies for you and your loved ones. Myth: You’ll have time to grab a box of photographs if the house is on fire. Reality: If there were a wildfire approaching, maybe. But when you smell smoke or hear the tornado siren, you move fast. The boxes are heavy. You’re panicked. In fact, the boxes are a fire hazard themselves, sitting at the foot of the attic stairs. Solution: Grab 10 key photographs you want to keep. Put them in an archival envelope and stash them by your bed. Whew. Does this mean you can’t bring them all? Yes. Is your life more important than photos? Yes. Are you like some members of my family? Have you stockpiled boxes of photographs thinking that you’ll eventually frame or place in an album? Oh dear. Before you add anything more to that collection, let me help you with a few lessons learned from both sides of my family in recent years. Myth: All your photos can be safely stored in the attic. Reality: Do you hang out in your attic in the summer? Nope. Neither should your photographs. Just think about all those old damaged photographs from your Grandmother Tessa’s trunk. It wasn’t just tobacco and coffee staining those up. It was heat, humidity, and mold. While the attic might be the "safest" place -- nobody will accidentally toss them out -- its also generally the warmest place in the house. And the most humid. Climate changes between seasons are enough to leave them a crumbled mess. Solution: No need to display them. No need for them to be convenient, but temperature control matters. Just keep them in your main living area or the basement. High shelves, to avoid flooding, are best. Myth: The photographs are in plastic so they should be fine. Check the details on that plastic storage box before you invest in it. Periodically check the box for cracks, holes, or faulty seals. (e.g. Have you overpacked it and prevented it from sealing?). Gauge the weight of the box. If you had to move it, could you? No, really? Myth: No one goes into that attic but me. Reality: Ever experience a squirrel invasion? Or had to fumigate an attic for bugs? Does your cat or dog ever escape up there? Could you find all their, ahem, droppings, if you had to? Attics get unexpected critters and they don’t all discriminate in what they destroy. But I’m talking about humans too. Solution: Check boxes for food and drink stains that could attract critters. If you find any, get a new box. Bonus points to you if you use acid-free storage boxes. Great-Grandma Lillian and Great-Grandpa Raymond both grew up in Louisville, Kentucky. But under very different circumstances. He was the son of a doctor. She lived across the proverbial tracks. He was an only child. She the youngest of nine. In the roaring 20s, life was good. Raymond loved to plink out a tune on the piano. Lillian made the best chicken n’ dumplings I’ve ever tasted. The Great War had been fought over a decade before. The flu pandemic was long gone. Electric lights were an exciting new invention. The stock market crash wouldn’t happen for another 5 years. And in this snapshot, now nearly a century old, they are proud. Happy. Almost giddy. Just two people taking a moment. Capturing life as it was. Now three generations get together every 4th of July with deviled eggs, green beans, and fried chicken. Three children, seven grandchildren, 12 great-grandchildren, 9 great-great-grandchildren. And counting. What portrait holds power for you? What snapshot do you have, which tells the story of so many lives? Who are YOUR Raymond and Lillian? Have you ever taken a photo from the height of a child? Really bent down to their eye-level? It makes a huge difference in the frame of the photo. It also reassures your child that while an adult, you’re still part of their world. This may also change the expression in their eyes! Sniff! Sometimes the photographer tries to take it all in. The house. The yard. The roller coaster. The jungle gym. And sometimes that’s fine. However, don’t forget to crop. A close-up can capture so much more. His first day of school “hairdo”. The barrettes she just had to have. Try to use the same one every year. First, it establishes a routine with your child as they grow up. Second, you can display this shot to show how they’ve changed over the years. Fireplace. Front steps. Foyer. You choose. Another idea? Take a pic in front of that sapling you planted when you first moved in. One more? Stop by the grandparents' house for a surprise and quick photo opp. Kids will be kids. It’s the natural way of things. While you may prefer a more traditional image walls or holiday cards, there’s nothing wrong with mugging the moment. Ask them to make a silly face or to dance to their favorite song. Gaze wondrously at their whimsy! Freeze-frame their fun-loving personalities! Have a pet? Take a few minutes to graph a photo of the two of them together. From iguanas to goldfish and basset hounds to Bailey the hamster, it’s all about the love. Snap them at feeding time. An action shot is fun too -- perfect for a rambunctious puppy! I have a secret to share … not all of the framed images in my house are great photographs. In fact, one of my most treasured photos is a snapshot. And I’m a little obsessed with it. I have copies of this photo in two different email accounts and its backed up in at least 2 other places. Plus, I have it in multiple sizes of paper copy, including 1 in my fire-proof box - just in case. Why on earth would anyone go to all that bother, right? For a photograph? Because to me, it’s more than a photo. It’s the last snapshot taken of me and mom together. It was taken at Rockefeller Center - yes, the Rockefeller Center in Manhattan, NYC. Neither my mother nor I look like the epitomes of fashion. We’re both the definition of the casual tourist. Disheveled. Exhausted. Smiling. TOGETHER. New York City was one of Mom’s favorites. She loved it in movies (The Godfather, Saboteur, The Thin Man) and I’d always promised myself that I would take her there. Since my parents’ divorce, mom’s vacations had been limited to a handful of trips to family living outside KY. I wanted to do something special just for her. As we walked from Penn Station, she basked in the energy of the city. As we took a detour past FAO Schwartz, Mom giggled remembering Tom Hanks sliding along the long, giant piano keys in the movie Big. If I take a deep breath, I can hear the squeals & giggles of the children on the ice skating rink below. I can smell the hot dogs from the nearby vendors. I can see Mom grinning at some kids playing tag. I can see her making eye contact with young moms, reassuring them of their motherhood skills with a nod & a soft smile. I can feel her passion as she beckons me to the historic plaque nearby. A single photograph can do all types of things, even bring back a few moments with a loved one no longer with us. What photograph means the most to you today? Are you protecting it? How will you preserve your memories for generations to come? Pictures have so much power, don’t they? There’s nostalgia. And memories. Multi-generational moments. And messy children. They can represent the day you got married, the moment when your laughter becomes a cackle, the year you got your braces off or the last month with a loved one. A meaningful photograph is the stuff of legends. That’s why it’s easy to get caught up in the emotion instead of the project details. Organizing a photography session -- let’s face it -- is not for the faint of heart. Before you fall in love with the idea of that gold-framed portrait above the fireplace, you have to choose the right photographer. I can help. A lot of photographers include the basics -- they snap a session and send you hundreds of digital files a week later. Lickety split. Sounds fast and efficient. That might be for you. But others (that’s me!) can provide a whole slew of services including wardrobe consultation and selection, session-day direction and prompts, as well as portrait display options, then send you a reasonable (and previously vetted) amount of high-quality photos. (No closed eyes or slouching to sift through). This is a very personal preference. Some photographers choose five photos themselves for retouching. Others let the client choose. Some retouching can make you look dramatically different, modifying eye color, finessing your hair tone, restoring your body shape to 20 years ago and removing all traces of non-head hair. Others prefer a more natural route (I’m the classical type) and photoshop out more major issues like hair in your face, blemishes, softening lines around your eyes, or a shirt rumple. My advice? Consider your style. Review the portfolio. And then go with your gut. the turnaround of proofs and touch-ups (I need these for my holiday cards!). Finally, once you order, how long will the photos take to be delivered? Flexibility (take all the time you need!) is helpful, but accountability and deadlines are nice too. I prefer to meet with people in person after curating a gallery of 10-20 proofs. That gets the portrait on the wall in a few weeks, rather than a few months. But you know your lifestyle and schedule best! While most people choose a photographer based on personal connection -- and this matters --what’s equally important is a photographer’s style. Are they more documentarian with action shots? Or do they pose people carefully? Are they more akin to weddings or multi-generational portraits? Is there an artistic quality to their portfolio or is their style more straightforward? Only you know what’s best for your family, your home and your happiness! Often clients wonder if a Personal Branding session is too complicated, but I've developed a 5 step process that makes the experience efficient, productive, and relaxing because the details are taken care of. A simple phone call or email will get the ball rolling. Please let me know what type of photography you're interested in and the best times or dates for a quick phone consultation to learn more about your needs. Since you're interested in Personal Branding, I'll perform an initial review of your online presence. When we speak, we'll review your short term goals for the photographs and your long term aspirations for your personal brand and career. 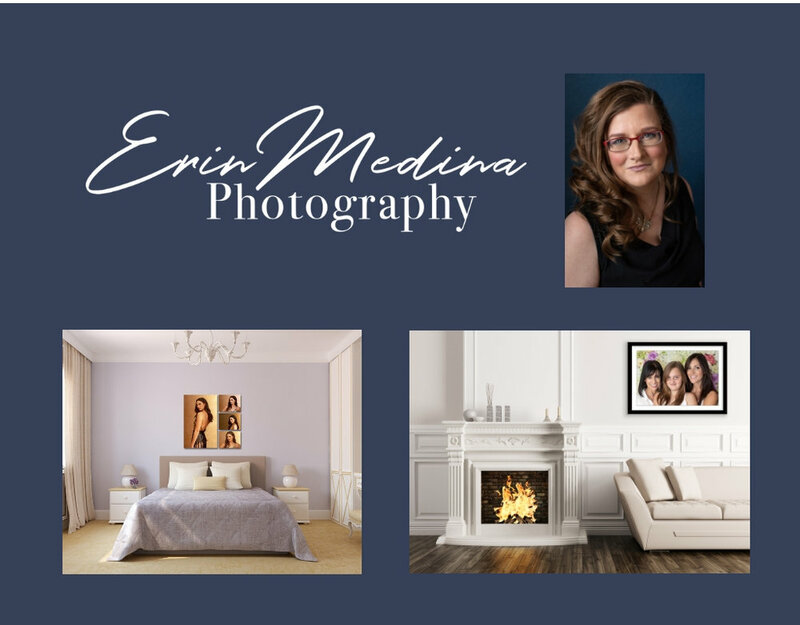 Additionally, we'll review the signature options offered at Erin Medina Photography along with any questions or concerns that you may have. To best suit your needs, I may need to create a custom quote which is not problem at all. When you book a Personal Branding session, you will also schedule a Design appointment. First, we'll review where you want to take your brand & your specific needs - just in case anything else has come to mind since our phone. Additionally, we will review your wardrobe options, potential color harmony that you'd like to leverage, the tone you'd like to share in the photographs, the possible body language you'd like to create, and many other aspects of the session. When you arrive, we'll go through the wardrobe options you've brought & do a final plan for the session. You'll step into hair & makeup with a professional Hair & Make Up artist. Then, you will be professionally directed so that the images flatter your figure and correspond to the body language that you wish to use to engage potential clients. Plus, I will walk you through creating different expressions so you have a variety of images to choose from. Unless otherwise arranged, typically you will review a curated, retouched gallery of photographs from your session with 7 business days of your photography session. Occasionally, clients need a faster turnaround and I do my best to accommodate those requests. Upon viewing the images, it's simple - you buy what you love. Personal Branding vs Headshot: How do I know which session type is right for me? The simplest way to determine what session types is best for you is to call for a quick phone consultation. It takes about 20 minutes to go over some basics about the offerings at Erin Medina Photography. Additionally, if you're looking for service for an office, I'd love to speak with you to learn more about your needs, preferences, and aspirations and then provide you a custom quote so you get what you need on a timetable that will work for you. Now what are your goals from the session? For instance, how many images would you like to have? A single image for a profile online or in print? A set of images you can rotate through out the year or use for a variety of audiences? Do you have an existing image? If so, what do you like about it and what do you not like about it? How would you like a new portrait or set of portraits to be different? Have you been professionally photographed before? How would you like this experience to be different? Simple, efficient service & session? In depth approach with a review of my existing imagery, time to plan new photographs to complement my goals, and a longer session to photograph multiple roles that you serve? What type of budget do you have? How do you know? ... If you should update your profile image or headshot? In my experience, many people know they should update their headshot, another group are on the fence, and others simply aren't concerned for a variety of reasons. How current is the portrait? When were you last professionally photographed for your career? Does the image look like you? In other words, if you were meeting someone for the first time, would he or she be able to recognize you from you headshot? In the photograph, where are your eyes directed? Are they directed to the audience to engage them? Or are they looking off to the side? Also, how distant are you in the photograph? For instance, is the perspective near and close, or far and distant? Is your portrait of comparable style & quality wherever it appears? Specifically, are you presenting a professional calibre image across platforms? For your professional profile images are you mixing professional images with snapshots? What body language are you using in the image? What does that body language convey? Does the expression in the photograph engage your client? If you were to ask a stranger, would they think you're confident in yourself & your brand? Is the image appropriate for the brand you wish to project? Does it reflect you at your best now? Does it reflect where you want to be in the near future? The truth is that you probably know whether or not it's time to update your headshot. The trickier part is determining what images you need for your brand and knowing where and how to make the best use of your images. Personal Branding: What's it all about? Ultimately a personal branding photograph reflects the individual, their mission, and the services provided rather than emphasizing an item. Dream Shoots will be arriving in Spring 2018. With a planned initial offering in the Nashville area, I hope to take these shoots to other destinations later in the year. Have the kids begun school, but you keep postponing grabbing a few quick images to mark the occassion? Do the images you capture reflect the personality of your child? To help you, I've compiled my top 5 tips for capturing back to school imagery. 1. Get on their level. One of the best pieces of advice I ever received about photographing children comes from the leader of Washington Photo Safari, E. David Luria. Kids are smaller and while you may love to look down at their angelic faces, they will look more accurately proportional if you pop a squat or take a knee to get their eyes even to the camera. Alternatively, if they're climbing along a set of stairs, then climb with them to keep their gaze in camera focus. 2. Snap them on the go. Does your child run to the bus stop every day? Does he or she hop up the stairs when they come home? Has your kid reached a new height and now capable of reaching the door handle or the doorbell? Grab a shot of them performing their everyday actions. 3. Remember to include the everyday items (e.g. backpacks, lunch kids, toys, digitals for the tweens & teens, instruments, etc). Did they ask over and over for a backpack with a specific character on it? At home, do they play with a certain toy each day? Is he or she regularly on a phone or tablet? Capture them doing what they do best. 4. Include the playmates, siblings, and/or pets. Be sure to capture an image that reflects their current favorite and frequent playmate(s) Often its a sibling or pet, but sometimes its a neighbor or schoolmate. Snap a quick frame when they're doing what they do best whether its in a sandbox, on the playground, playing tag, etc. 5. Get them in their environments. What's their favorite hideout when playing Hide 'n Seek? Do they have a favorite reading or drawing nook? A secret spot in a treehouse? Maybe its a table for blocks or playdoh? Photograph them in the spots where they are content. When you'd like to schedule something a bit more structured to capture everyone in the family together, please give me a call or email to schedule a consultation.